Temperature and precipitation can affect the production of sap by maple trees. While it can be hard to pinpoint on the calendar, tree sap usually begins to flow when birds that have been away for the winter begin to return, daytime starts getting noticeably longer, and the extra sunshine prompts temperatures to surge above freezing. Many tree species produce sap that people can use, but maples are particularly popular for their sweet syrup. A single maple tree can produce enough syrup for a family to enjoy and share, said gardening hobbyist Dan Tyler in a Feb. 11, 2017 presentation at the Wisconsin Garden Expo. Collecting sap and refining maple syrup can be deceptively simple explained Tyler in his talk, which was recorded for Wisconsin Public Television's University Place. "Wait for the temperature to go above freezing during the day, and below freezing at night," Tyler said. "Poke a hole in a tree, hang a bucket on it, collect the sap, boil it for a real long time, can it, drink. That is the entire process." But precision and attention are required at some points, warned Tyler, referencing an event his family calls the "great kitchen fire of 1990," when an attempt at making maple syrup ended with a scorched ceiling after sap was left to boil unattended. When making backyard maple syrup, the first step is tapping, which should only be undertaken on a mature tree with a diameter of at least 12 inches. Using a 5/16 inch drill bit to create a hole with a slight upward angle and a depth of 1-3 inches will allow sap to flow without damaging the tree. A wooden spout called a spile can then be gently hammered into the hole. A collection bucket or bag, ideally one with a cover to keep out debris, should be hung from the spile or a small hook inserted above the tapping site. This collection container should be emptied daily, and the collected sap stored in a refrigerator or other cool, shaded place. When it's time to refine the collected sap into syrup, it is important to consider the time and ventilation required. Syrup is produced by slowly boiling away water in the raw sap, and refining one gallon of syrup can result in almost 40 gallons of steam. 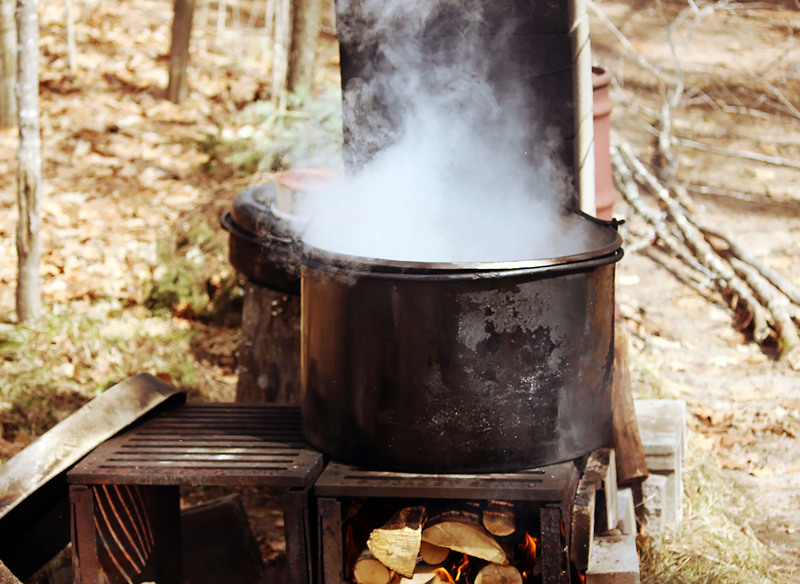 Some syrup makers refine sap outdoors over a wood fire or other heat source, but it is possible to process sap indoors by using fans and other means of ventilation. Maple syrup is often refined outdoors over an open flame. "Be very cautious about boiling sap in your house. Don't leave it unattended ... because it could boil in and you'd ruin the sap." A slow boil, which can run 10 to 15 hours, helps keep the syrup from cooking too quickly and burning. Sap should be added to a pan with a wide surface area a little at a time to allow its water content to boil off quickly and continually. While this process can be time consuming, the consistency of the syrup and the formation of the bubbles will change suddenly when it reaches around 67 percent sugar content, or measures at around 217-219 degrees on a candy thermometer. 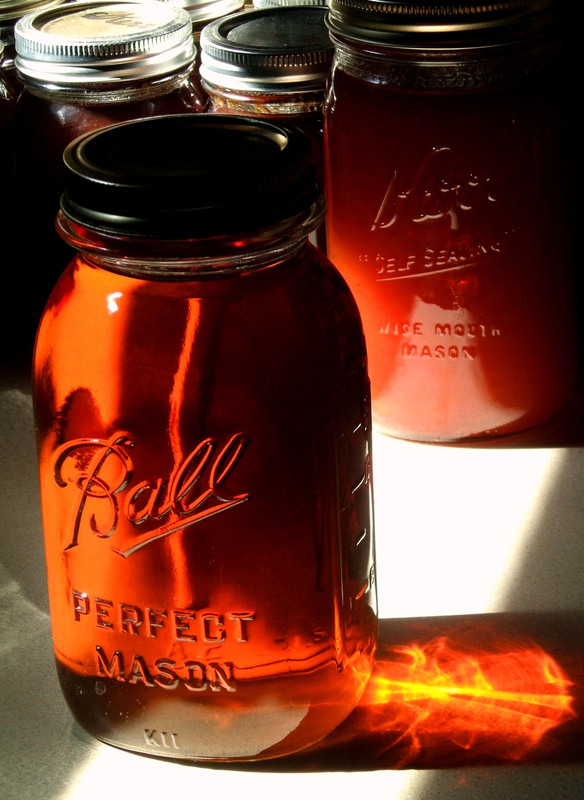 Homemade maple syrup can be preserved in sealed jars. Once the sap has been transmuted into syrup, it can be strained through cheesecloth and then immediately consumed, stored in the refrigerator or preserved for shelf-stable storage or gifting. "If canning isn't your jam, then just drink it, use it," Tyler said. "Hobby maple syrup making is a joyful process where you make something that is extremely simple and extremely delicious. … I try to get past that notion that I need to horde all of the good stuff in life." The sugar maple (Acer saccharum) is Wisconsin's state tree and widely used in syrup production. However, it is not the only maple species that can be tapped for syrup. Other maple types include red (Acer rubrum), black (Acer nigrum) and silver (Acer saccharinum) maples. Other types of tree also produce sap with enough sugar to create syrup, including birch, box elder and palm. The timing and volume of sap collection can vary by year and is influenced by temperature and precipitation. In general, higher amounts of precipitation in preceding seasons will result in a higher volume of sap production the following spring. Although sap does not begin flowing until daytime temperatures exceed water's melting point (about 0 °C or 32 °F), the early arrival of warmer temperatures ;can shorten the sap collection window. When overnight temperatures do not fall below freezing, production slows and the sap that is collected may appear cloudy or taste spoiled. Like milk, sap can spoil if it is left unrefrigerated and its temperature exceeds around 40 °F. On warm and sunny days, it may be beneficial to empty and replace collection buckets more than once, as the sap will flow more rapidly and be at a greater risk of spoiling in warmer temperatures. When stored in a refrigerator, maple syrup will last for many months. It can also be canned for shelf stability by allowing the freshly-made syrup to cool to around 180 °F, then distributing it into pre-warmed, sterilized jars. Once the sterilized lids are attached, no additional steps are required because the syrup has just been heated above the boiling point of water and the remaining heat should be sufficient in sealing the jars. While it is best known as a topping for dishes like pancakes, waffles and French toast, maple syrup can also lend its distinctive flavor to other foods like yogurt, oatmeal and granola, or serve as a replacement for sugar in recipes or in drinks like coffee and tea. On the timing of maple syrup season: "The tree will tell you when it's time, but you can watch your 10-day forecast. This is an advantage that us hobbyists have over major producers, who need a lot of start-up time to get ready for their season." On how the temperature informs maple syrup hobbyists: "When it's warm but cold. Or your garden will tell you, when those first buds are starting to emerge. This is maple syruping time, the early season." On the appearance of boiling syrup: "If you undercook it, it's usually just a little lighter, and it's a little runnier — it's not going to cause you harm, it's just a little waterier. But if you really want to achieve that stuff that looks like what you're accustomed to, and a richer flavor, use your thermometer." On the length of the syrup refining process: "This is an interesting part of the process, because after sitting there for weeks, watching the buckets drip, and going hours and hours and hours and hours boiling, and adding a little more, and boiling and adding a little more, and boiling and adding a little more, all of a sudden the bubbles will change, the temperature will go up, and it's done. Boom. Do not miss this part of the process." On the end of the syrup refining process: "I have a timer in my pocket — 20 minutes, for example, until the end — when I sit in the kitchen with it, which is a great idea. It's just like your laundry, right? You put things in the dryer, you'll say, of course, I'll come back from whatever I'm doing, and then of course, you've forgotten the dryer, and everything is wrinkly. But the problem with this is that you burn your syrup, and the whole season comes and goes and you've missed it." On sharing the syrup producing process: "If your neighbor has a tree as well, why not share what you learned … with them? It is more than twice as pleasing to me to see these kids run out in the morning and look in that bucket, and lick that tree and be part of the process, than it is for me to make even something that I love so much at home." On gifting syrup: "People have a lot of stuff today and coming up with the perfect Christmas gift is not always easy, but I tell you what, a half a pint of homemade maple syrup goes over very well, year after year, even if it's not so much a surprise on the second or third year. I do get a good reception from it."